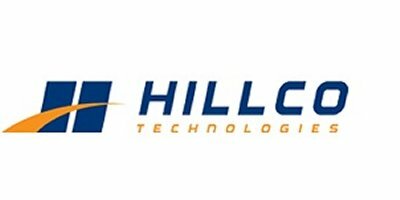 HILLSIDE - STS & S - Combine Leveling Systems - Leveling System by Hillco Technologies, Inc.
Hillco Technologies offers a broad range of leveling systems specifically designed to maximize STS & S Series combine's performance in all terrain. Hillco Leveling Systems are packed with a long list of industry leading features and benefits such astrue bolt-on design, fully automatic variable speed leveling, and fully automatic header height and lateral tilt control.Other benefits includeincreased hillside capacity, reduced hillside grain loss, improved sample quality, and comfortable hillside operation.Additionally, Hillco guarantees that your combine's original John Deere warranties will remain in full effect after installation of your Hillco Leveling System. 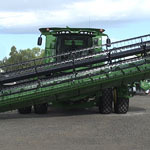 The newly designed undercarriage has been built to accommodate the increased combine weight and larger platforms and heads. Because we raise the front of the combine with the overcarriage/undercarriage it is necessary to raise the back of the combine. 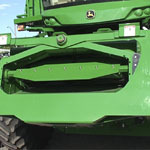 The function of the drop axle is to balance the combine fore/aft. This bolt-on component is located between the combine's main frame and rear axle. The result is an 8' increase to achieve maximum leveling. As combines and platforms get larger and heavier, Hillco continues to meet the challenge. Staying true to our time tested design; Hillco Leveling Systems are equipped with an advanced master/slave hydraulic circuit, coordinating rotation between the combine chassis, header and ground to deliver optional ground hugging performance. This feature can be performed manually to give you control over unusual ground contours and any nasty terraces. Equip your header with Contour Master Sensors and enjoy the superb performance of fully automated lateral tilt/header height control. When you purchase a new John Deere combine with a Hillco Leveling System you will experience maximum throughput. You can be confident the Hillco crop feeding system is designed for any type of crop whether it's green, viney crops and weeds or short, slick straw conditions. The Hillside models use a low maintenance paddle beater feed system to handle the heaviest of crops. Bearings on the paddle beater shaft are protected by a cover that turns with the shaft which reduces wrapping and promotes longer bearing life. The paddles are available in either metal or rubber. 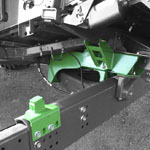 Why should you invest hard-earned dollars on a Hillco Leveling System for your combine? We believe you shouldn't have to sacrifice your combine's full potential just because you harvest in the hills. Harvesting with a Hillco Leveling System means you remain level at all times; putting all of the grain in the tank instead of leaving it on the ground. We don't expect you to take our word for it... we've had extensive field testing done to quantify how much grain you are actually losing when you are running a level-land combine in the hills. To find out how much grain you are losing, visit our ROI calculator here. During harvest, time is money. So why buy a new combine and then sacrifice up to half its capacity in the hills? The technology incorporated into Hillco Leveling Systems eliminates the need to reduce sidehill harvesting speeds and is a perfect complement to today's powerful combines. Many harvesting expenses are related to the time it takes to harvest. Labor: shortening your harvest equals fewer man hours required for combine drivers and other harvest personnel. Fuel: shortening harvest time means harvesting equipment is running fewer hours. More time for more acres: The hours saved with the combine's increased capacity in the hills means there is more time for more acres without having to purchase another combine. Get it in the bin: The longer the crop stands in the field the greater the exposure to weather and the risk of dry down. Being able to get the harvest out a week early can add tens of thousands of dollars to your bottom line. Hillco has warranty agreements with all major North American combine manufacturers ensuring that the installation of Hillco Leveling Systems does not affect the existing combine warranties. Faster harvesting speeds mean fewer hours on your combine and that equals greater value at trade-in time. A Hillco Leveling System retains an average of 60% of its original value whether it is 5 or 15 years old. No one buys a leveling system based on comfort, but it is one of the main reasons people give for never operating a level-land combine in the hills again. With the combine level on your hillsides, you will be able to fill your grain tank to capacity. The unique bolt-on design of Hillco Leveling Systems makes dealer installation a convenient option for both new and pre-owned combines. There is always a knowledgeable and friendly product support specialist available, along with owner's manuals and parts books to help with troubleshooting. No reviews were found for HILLSIDE - Model STS & S - Leveling System. Be the first to review!